Little gives me greater academic pleasure than finding an original source that adds significantly to an idea that I’ve been batting around. That happened today. Regular readers know that I am approaching an early, self-imposed deadline for my non-fiction book on virtual law, and as part of that, I have been digging in to some of the older works on this stuff. 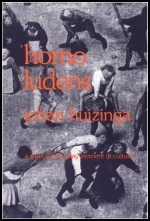 I’d seen references to Homo Ludens: A Study of The Play Element in Culture, a 1938 book by Dutch historian Johan Huizinga (originator of the concept of the “magic circle” to protect play spaces from the world, and vice versa), but I hadn’t tracked it down yet. I just got a copy, and I was excited to find that it has a chapter entitled “Play and Law,” which includes the following passage on the relationship between play spaces, the magic circle, and legal systems. Every place from which justice is pronounced is a veritable temenos, a sacred spot cut off and hedged in from the “ordinary” world. The old Flemish and Dutch word for it is vierschaar, literally a space divided off by four ropes, or, according to another view, four benches. But whether square or round, it is still a magic circle, a play-ground where the customary differences of rank are temporarily abolished. Whoever steps inside it is sacrosanct for the time being. [...] Let us turn back once more to the archaic forms of legal procedure. Any proceeding before a judge will always and in all circumstance be dominated by the intense desire of each party to gain his cause. The desire to win is so strong that the agonistic factor cannot be discounted for a single moment. If this does not of itself suffice to disclose the connection between legal justice and play, the formal characteristics of the law as practised lend added weight to our contention. I’m sure this rings true for some of the litigators who read this blog, and it also helps explain the large number of attorneys I have met who play online games, and who have a secret desire for a second career as game designers. Good find. Very good find. Thanks Taran – I think I mentioned this, but I ordered Future of Reputation via your site after your post on it. Haven’t read it yet, but it’s at the very top of my (too large) book pile. I’ll be checking my local library in vain no doubt. When I first loaded your page I saw the book cover graphic but took the title to be ‘Homo Lindens”. Glasses really helped! There’s nothing quite like digging into the history of your chosen subject and coming up with a nugget. …which still may have some valuable points. @6 – comment of the month. And now I am really tempted to title my chapter on potential pitfalls to watch out for in virtual worlds, “Everybody Poops.” I have a feeling my publisher might balk at that though. The magic circle/space of class-free justice is not just a dream of lawyers. I think there might be some indirect connection between heightened awareness that the court system is out of reach for the lower and middle class (thus whatever rights they have can’t be vindicated) and the attraction of virtual spaces with means of solving disputes (appeal to guild leader, post a server-wide broadcast message to denounce a villain, or if all else fails take out your trusty Sword of Swift Justice). I live in California and know a bit about our State court system. Judges here can resort to various technicalities to refuse to hear people who represent themselves (or are forced to represent themselves through being unable to afford a lawyer or find pro bono help). Therefore, great injustice can occure just because the Judge only listens to one side. There is no means to complain about this other than the Appeals Process, which is even more expensive than the original court procedure because of the cost of transcripts. Also a lot of people think the ACLU automatically steps in when any grave miscarriage of justice is about to occur. In California, the ACLU only supports Appeals cases…and even then they have to be selective. Normal citizens also have absolutely no recourse when a state agency or branch of state government acts outside of jurisdiction. The Governor’s Office sweeps demands for investigation under the rug. Thus it fall back on the individual citizen to sue to maintain their rights…and most just don’t have the means to do this. If other States have the same inadequate and costly court system as California, I think it’s only a matter of time before the veil of “individual rights” drops, and the true system of “rights protected only for elites” is revealed. However, I think the problem of the inaccessible court system is already bubbling in the public subconscious, and partly fuels the search for justice in virtual spaces.